On one of those elusive spring days when the air has no chill, I started thinking about sunscreen, popsicles, and sand toys. We’ve been walking to the beach most days to watch dogs run with joyful intensity, to play on the playground and dig in the sand. Tools and toys for digging certainly are not a requirement but I realized that the beat up sieve, big red spoon, and empty ice cube tray that Amos often uses in the kitchen would also be perfect for the beach. We found a stainless steel bucket at Goodwill, just right for a two year old to collect water and make sand cakes. I love being able to come up with creative ideas for reusing what we already have and making better use of things that might go to waste. When we’re not at the beach (or the playground, or the library) we sometimes paint. Amos mostly likes dipping the brush in water and brushing the water onto the paper. I like to saturate the brush in a bright color to and swirl it into random abstract designs. Since we go through paper fairly quickly, I wanted to find a way to use it again. Cutting and gluing the paper into envelopes is a way to give another life to a piece of paper that might not have much use otherwise. Sending it to someone with an in depth letter or a quick note tucked inside gives it a third chance to be useful and meaningful. 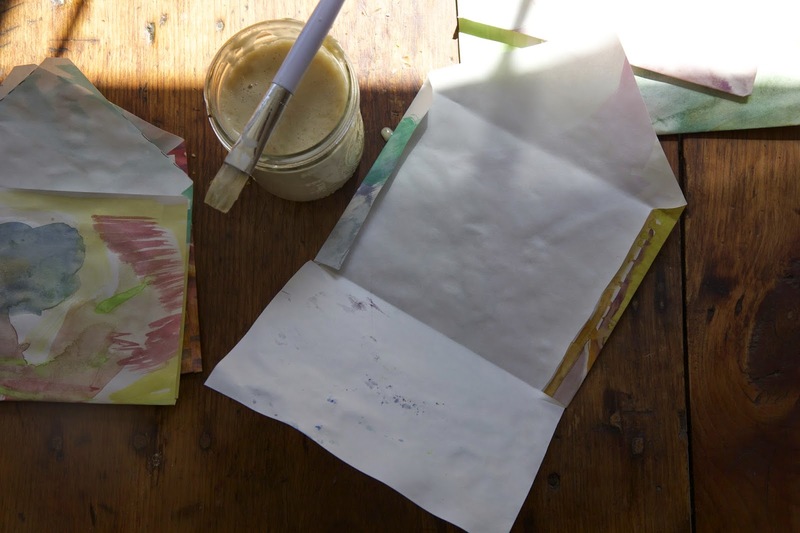 I have made envelopes from all kinds of paper including paper bags, magazine or catalog pages, and art work. I have used tape and a variety of glues to stick them together. 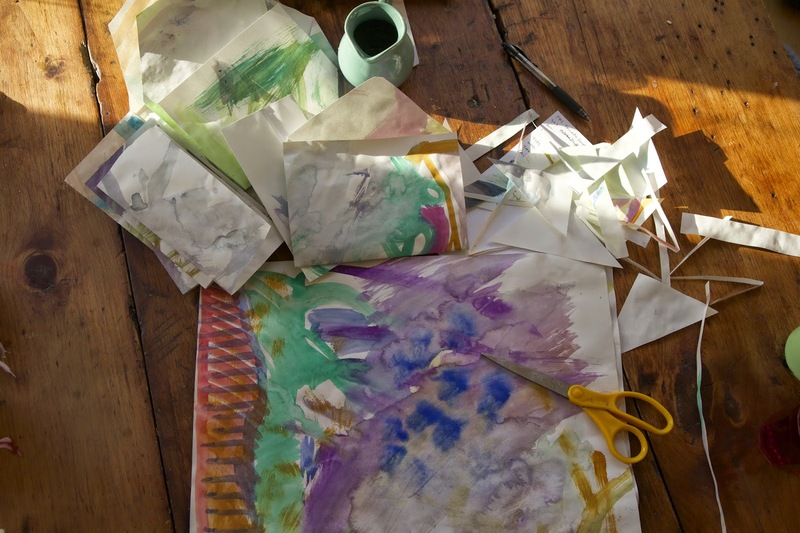 This time I wanted to put them together with something non-toxic that could biodegrade along with the paper when the envelope was no longer necessary. Instructions for the envelopes and glue are below. I used large sheets of paper and cut each in half. One half became the envelope, the other half I cut and folded into two cards. I cut the envelope paper into the shape shown above. 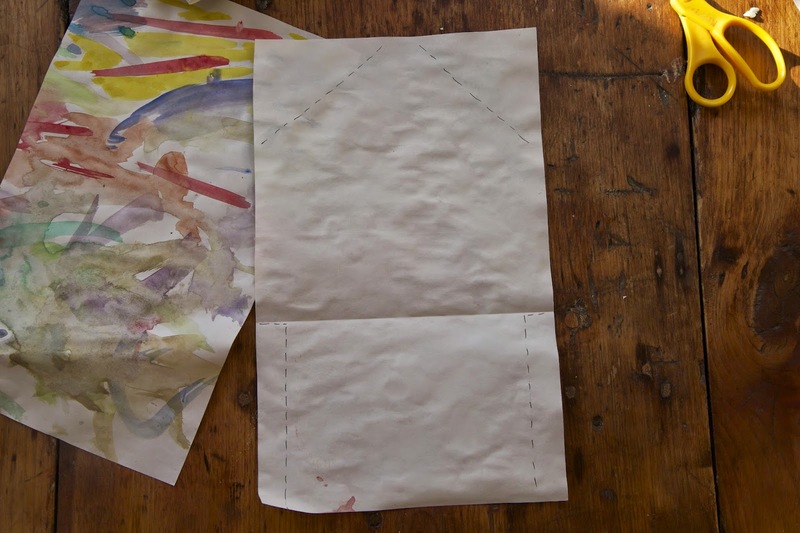 You can make an equally simple envelope without cutting the paper but I like this basic shape which leaves plenty of room inside. After cutting, I folded the side flaps in, the bottom up, and the top down. Brush some glue on the side flaps and fold up the bottom. Press the bottom to the side flaps to make sure the glue has sealed. 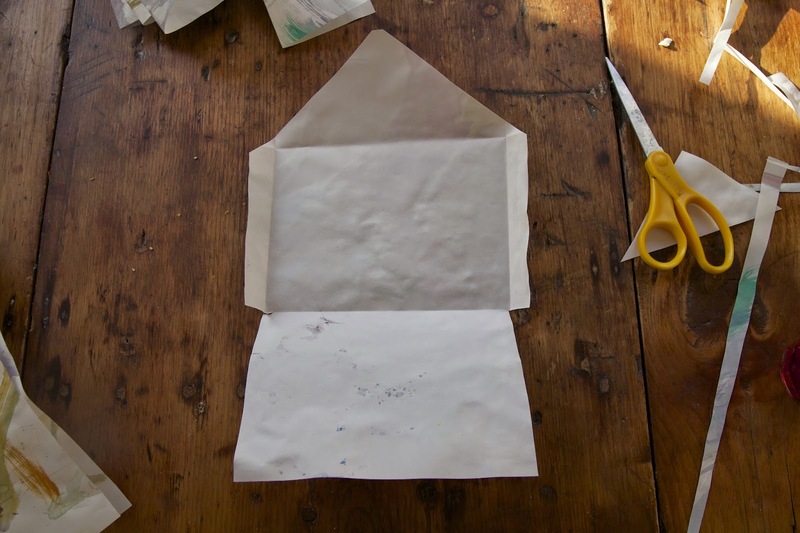 You can use glue to seal the envelope once you have tucked your letter inside. This glue seems to work really well and it uses ingredients you probably have in your pantry. I wish I had thought to cut the recipe in half because I have way too much glue now but it is easy and cheap. I store it in the fridge. Just shake it before using if it has been sitting for a while, it may separate. Recipe adapted from this one. Combine the flour and sugar in a saucepan. Add about half of the water and whisk until smooth. Add the rest of the water and the vinegar. Bring to a simmer and whisk until it has thickened slightly. Use when cooled. Store in an airtight container. How handy! Now I'll never find myself without glue again. Yes, it is nice to have an easy way to make glue!